NOTE: For an additional 10% off this item use coupon #75529! 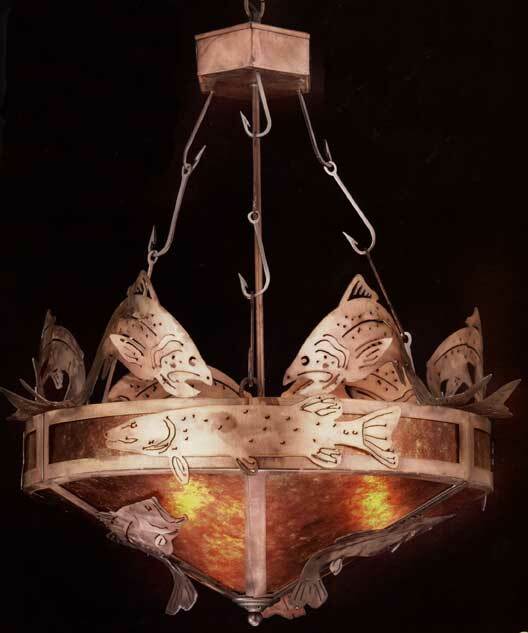 This original design features antique copper-finished metal cutouts of Rainbow Trout, Largemouth Bass and Northern Pike complete with fish hook chain design over a shade of Amber Mica. Fisherman�s delight! Overall height: 32�. Shade dimensions: 15� high X 24� wide. Takes three 100 watt bulbs. NOTE: These items are hand-made to order. Please allow 4-6 weeks for delivery.